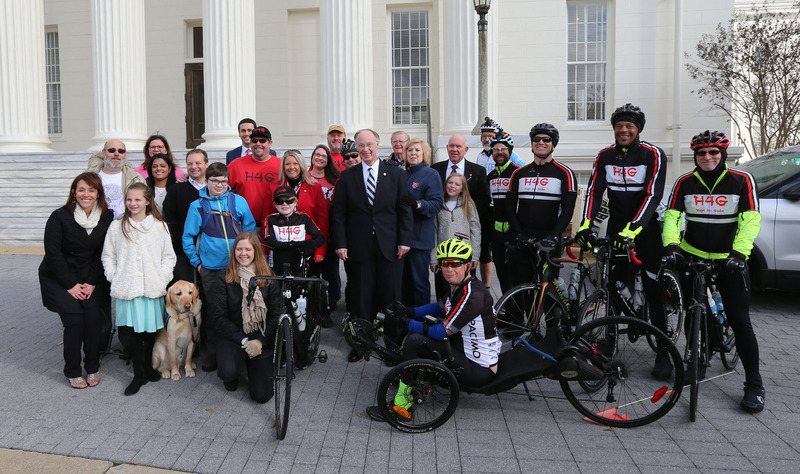 Governor Robert Bentley lent his support to raising awareness of rare diseases on Tuesday by welcoming a group of cyclists riding in support of the creation of a Rare Disease Advisory Council to the Alabama State Capitol. State Representative April Weaver, chair of the House Health Committee, also joined Bentley. In February, Weaver introduced a resolution to create the Rare Disease Advisory Council in hopes that Alabama will be one of a handful of states with a group dedicated to helping state lawmakers better understand and address the needs of rare disease communities. To bring attention to the newly formed council, the Birmingham-based Hope for Gabe Foundation, founded by Scott Griffin whose son was diagnosed with a rare and devastating form of Muscular Dystrophy called Duchenne, organized the ride in the same style as their annual Ride4Gabe. The cyclists began their journey at Cahaba Cycles in Pelham at 3 a.m. Tuesday and wrapped up their ride at the State Capitol in Montgomery. There, they met with rare disease advocates to discuss how the newly proposed Rare Disease Advisory Council can aid economic development efforts in addition to the benefits of greater collaboration among those affected by rare diseases.